These past few weeks have been some of the busiest of my life! First, as you might already know, my parents, uncle and cousin came to visit me for about a week. 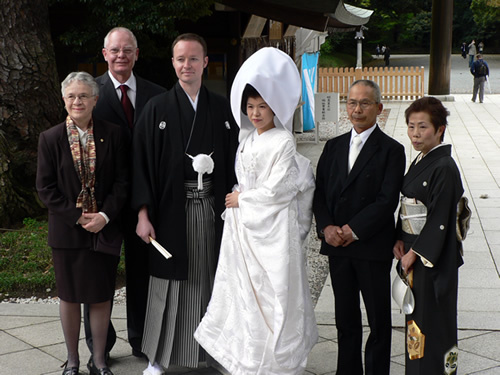 It was the first time any of my family have visited me in all my time in Japan, so it was quite an event. 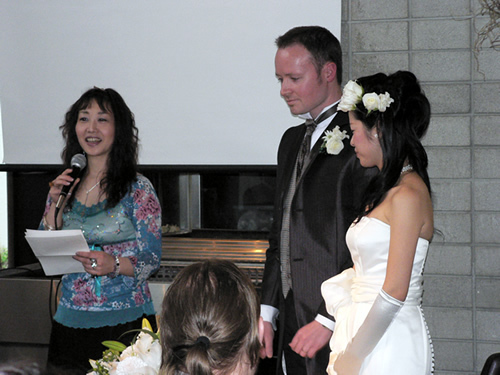 During it all, Kumi and I were busy organizing our wedding ceremony and reception, so each day was not only an adventure but also a lesson on how to deal with stress. 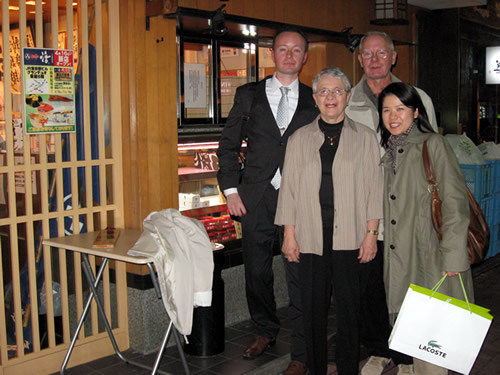 I was determined to make my parents trip as 'Japanese' as possible, so of course one of the first things we did was go eat sushi at my favourite sushi restaurant, 'Midori sushi' in Shinbashi. Here we are full of fishy goodness, coming out of the restaurant (no I'm not drunk here). No sushi pics, I guess we were too hungry to take pictures. 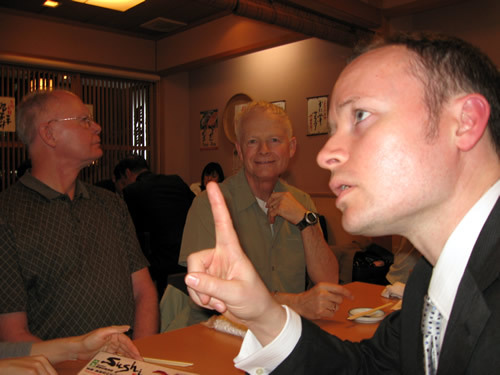 Quiz - What was I saying here? a) One order of tuna please, light wasabi, plus a side order of ginger. Make sure that the fish is fresh and fill up this bottle of soysauce here, chop chop! b) Excuse me, the ceiling fan just stopped working. c) Could you pull my finger? I thought hard about what to show them in Tokyo, but in reality, after you've done the Hato Bus tour, (which manages to cover a lot of ground, but wasn't all that great to be honest) and gone to Ginza, Akihabara and maybe Shinjuku, there isn't much to do except look at a lot of buildings, and ride the train. So? 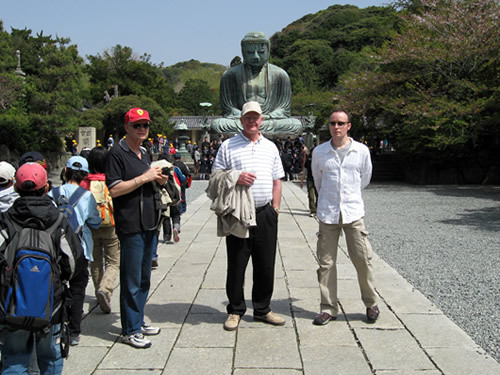 Out of Tokyo we went to Kamakura! On the way there we took the train during the morning rush! Believe me, I didn't do it intentionally. After arriving in Japan's old capital city, I was hoping for a bit of peace and quiet. However right after our first stop at the Daibutsu (buddha) a million schoolkids showed up for a field trip. Joy! My dad made history while waiting in the Krispy Kreme lineup. You know how they hand out free doughnuts while you wait? Well my father refused his! The girl handing them out did a double take, shook her head and asked again, clearly refusing to believe her ears, but my father firmly said 'no', stating that he wanted to save room for the one he bought. First time for everthing I guess. We went up to Hakone for a night, but it rained the whole time. So much for a nice view of Mt. Fuji which is pretty much the main draw. We then went up to Owakudani to get some of those black eggs that are boiled in the sulpher vents, but they were sold out... The hotel we stayed at was excellent though, good food, service and large rooms. Kumi and I were instructed by my uncle to pose here. Man that's one strange looking bear. 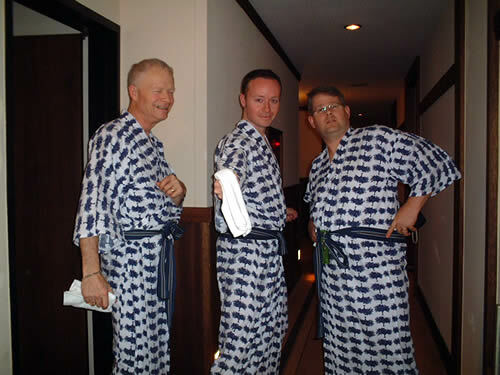 Getting naked with family members isn't a regular occurance in normal Western households, but my uncle and cousin wanted the 'full' Japanese experience, which means heading to the onsen (public bath). The hotel (still Hakone), being top of the line, had a pretty nice indoor and outdoor bath, and even better, we had the whole thing to ourselves! In all the commotion, I pretty much forgot that it (the 17th) was my birthday. 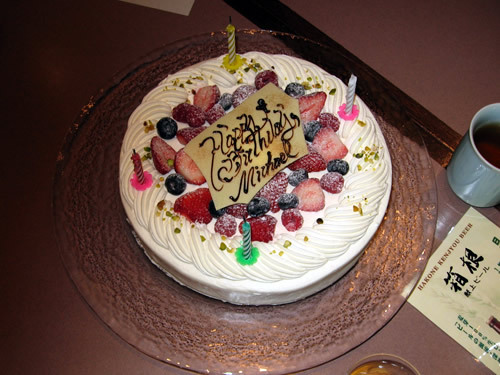 Kumi remembered though and secretly had the hotel we were at make a cake for me. Hooray! 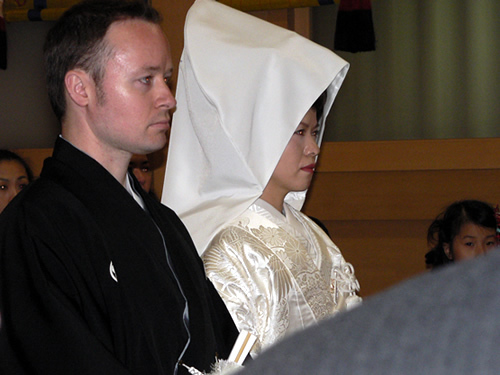 Here we are just before the ceremony getting educated on protocol, you know, when to bow or clap, when to speak, the proper way to drink sake and handle these special branches, etc. No smiles please, this is serious stuff! I had my picture taken more this day than every other day of my life conbined. Seriously. 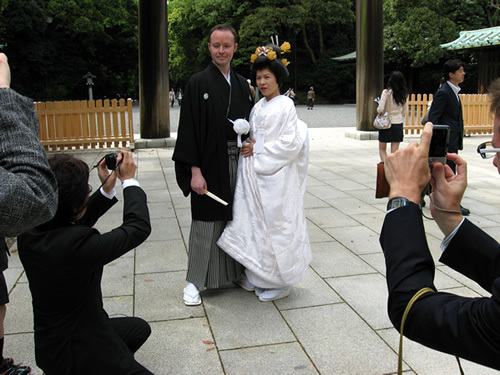 Not only did I pose for hundreds of pictures with family and friends in every conceivable combination, there were hundreds of random people and tourists also snapping shots of us. 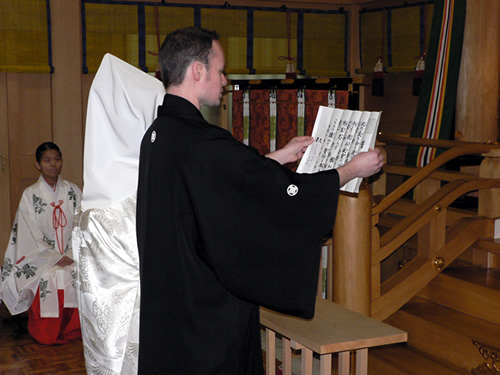 To be honest I had hoped to avoid the crowds of gawking people as the ceremony was early in the morning, but Meiji was packed. Now I know how Brad Pitt and Angelina Jolie feel when they step out in public. Once the party started though things went pretty smoothly. Everyone showed up and seemed to have a good time. Here's our MC Machiko (Kumi's school friend) announcing the beginning of bingo. We had a total of six prizes, the top prize being three Kobe beef steaks! 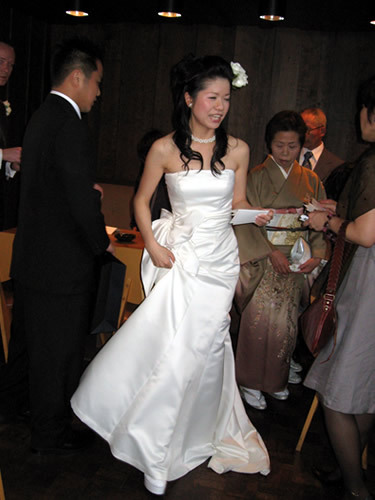 However five of the prizes went to Kumi's friends or family much to the consternation of the friends on my side. Luck of the draw I guess! 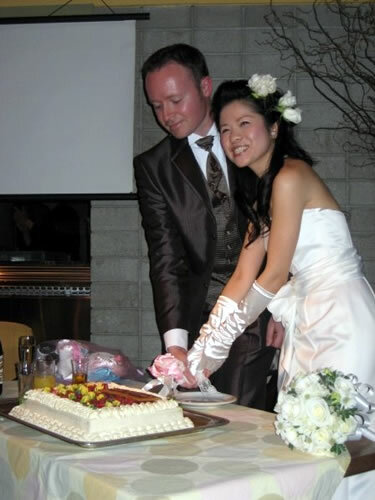 Cutting the wedding cake! This was the only thing I managed to eat during the whole party. The food looked good, but I was too busy mingling with and taking care of guests. Kumi only ate a bite of hers. Kumi and I surrounded by the gang, all of who you may have seen on this site before. 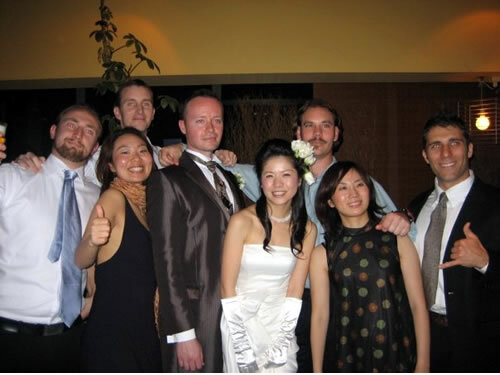 From left to right: UK Mike, Yasuko, Dale, me, Kumi, Jason, Hitomi and Jason. No rest yet! The next day Kumi, my parents and I all headed up to Fukushima to hang out with Kumi's family. Kumi's parents paid for everything including the shinkansen ride, putting us all up in an upper class Japanese hotel, and treating us to lots of fancy lunches and dinners. 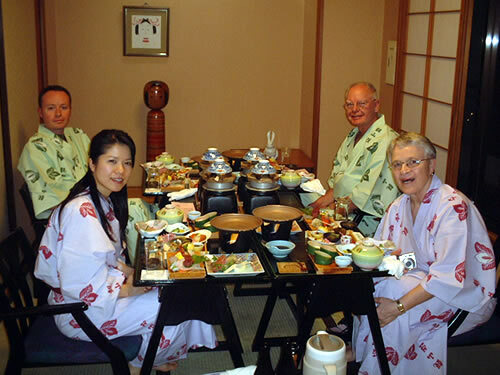 Here we are below enjoying our absolutely massive Japanese style (kaiseki) dinner. None of us even came close to finishing it. We visited a number of nice parks, including one where the cherry trees were still blooming. 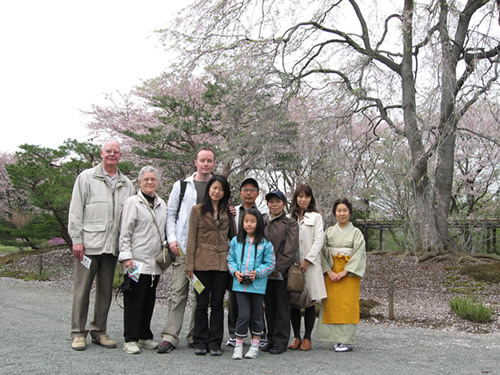 Tokyo's trees finished weeks ago so it was a good chance for my parents to see them. 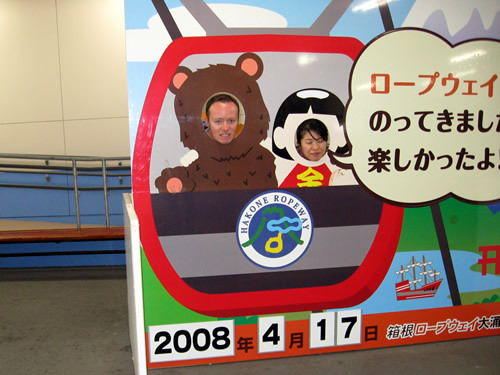 Here's both families below with one of the park caretakers (who happens to be a friend of Kumi's mother) on the right. All sizes are to scale. 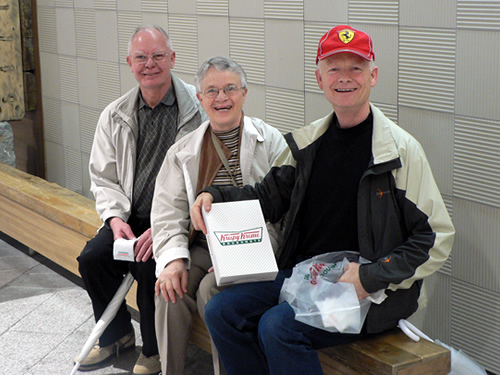 Then after spending one more day in Tokyo, my parents and uncle headed back home. My cousin had previously left a day earlier. What a week! Well actually 10 days to be specific. 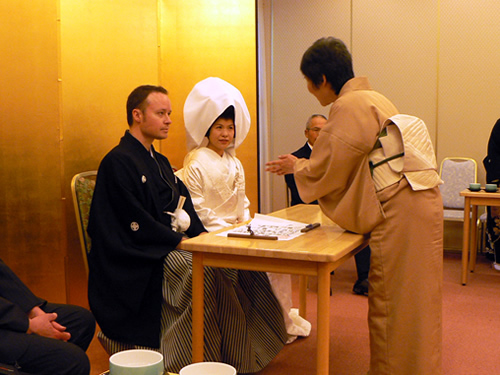 Congratulations to my family members for passing their Japanese initiation with flying colours! Especially my parents who have barely ever traveled overseas. Be it bizarre food or situation, they were all met and surmounted with enthusiasm. After the stress of everything, the whirlwind tour around Japan, the organizing, the parties, the rush hour trains, the guiding around, the eating, it was time for a rest. A nice long rest in Hawaii! But was it restful? Find out soon!